The papers of our I International Seminar held in Madrid on 3-4th February 2017 organized jointly by the Gender Equality Observatory of King Juan Carlos University and Wassu-UAB Foundation have been published in English and Spanish. 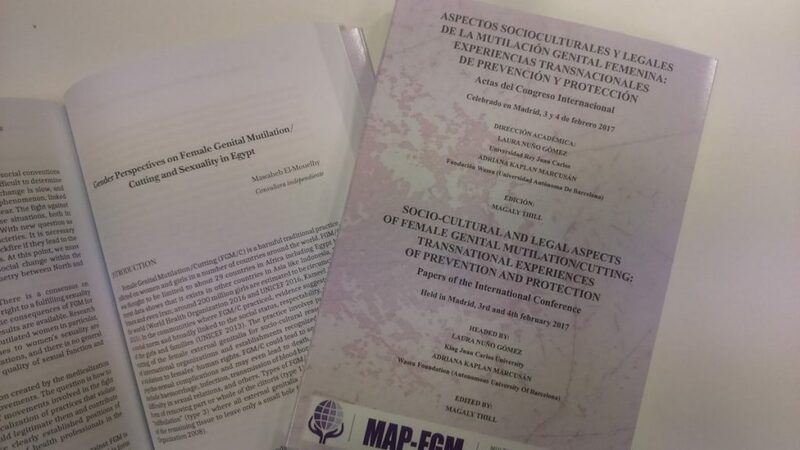 Under the title of “Sociocultural and legal aspects of FGM/C: transnational experiences of prevention and protection”, it compiles findings and experiencies of European and African researchers who took part in the seminar. The Conference was structured in two thematic axes. The first one allowed approaching FGM/C from three perspectives or fields of knowledge. Concretely, anthropology (Adriana Kaplan), feminist interpretative framework (Mawaheb El-Mouelhy, Armelle Andro, Ana de Miguel and Laura Nuño Gómez) and legal aspects of FGM/C (Agnes K. Meroka, M. Elena Torres Fernández, Julia Ropero Carrasco and Charlotte Chevalier). The second thematic block undertook an analysis of prevention and protection policies and was divided in three geographic panels. Els Leye, Elise Johansen, Sara Johnsdotter and Hazel Barrett presented their works in regard with FGM/C in Europe. African experiences were displayed by Fatoumata Coulibaly, Kemo Fatty and Marycelina Msuya. Finally, Nora Salas Seoane, Aina Mangas, Mª Teresa Martín de Villodres, Julia Pérez Correa and Ana Buñuel shared local experiences from Spain. The book is published by Dykinson publishers and is available printed upon request writing to observatorio.igualdad@urjc.es. You can also download the full text in English or Spanish (select your preferred language).